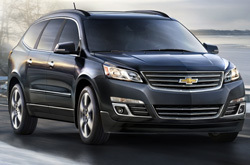 2013 Chevrolet Traverse reviews from Midway Chevrolet can be found underneath the video below. Where do we get these Traverse reviews? From prominent writers in their industry. 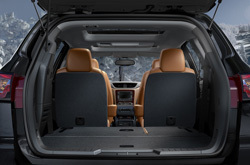 We're your Chevrolet Traverse dealer; this article will help you learn everything you need to know about the Chevrolet Traverse in Phoenix. Midway Chevrolet is always available 7 days a week to answer questions you have. Do not hesitate to call us to speak with our Traverse specialists. By examining the 2013 Chevrolet Traverse side-by-side with the 2013 Mazda CX-9, Honda Pilot and the Hyundai Veracruz, and you can find that the Traverse transcends those autos in various zones. View the hightlights below. Chevrolet drivers don't have to travel far to find exceptional auto repair technicians and authentic OEM made parts. Our Phoenix area Chevrolet repair center is conveniently anchored by a long list of cities and we protect our patrons with a gratis warranty on each repair. Midway Chevrolet's auto repair authorities will make your Traverse run strong, so drive it to our Chevrolet car maintenance center in Phoenix today. The following is barely a portion of what we handle: timing belt replacement, transmission repairs, wiper blade replacement and much more. We also manage a wide array of additional services. Midway Chevrolet is your safe bet in Phoenix for certified, professional Chevrolet Traverse repairs and scheduled maintenance. Click the upcoming link to be connected to Midway Chevrolet's service coupons.